​I will teach, instruct and guide you through the essentials of how to be proficient in woodturning - the subtle things that you absolutely cannot learn on YouTube. I bring over 20 years of woodturning experience to my teaching and woodturing classes. This has been developed through a combination of formal training, self development and advanced workshops with world re-noun woodturning artists (see Artist Resume page). All woodturning classes offered are one-on-one and are held at my studio in Selwyn Ontario, just outside of Peterborough. Two full size lathes are available in my studio. All materials, turning tools, safety equipment, thorough handout notes and a light lunch will be provided. I can also handle up to 2 people if there is a group of individuals or a couple that wish to take a workshop together. Most students are at the beginner to intermediate level, but all levels of turners are welcome. ​Classes are listed below and can be customized depending on the interest and skills of the student. 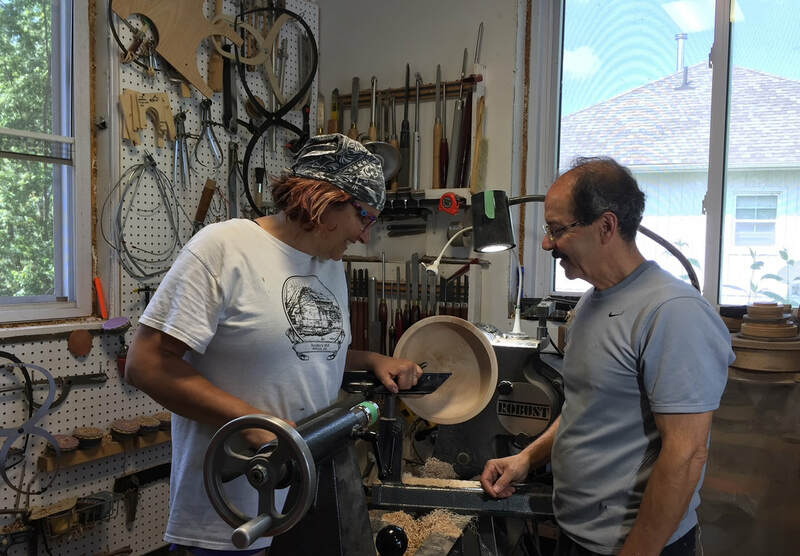 The prices are based on a one-on-one woodturning class and can be adjusted for a group woodturning workshop or lessons. To book a woodturning class, email me from the Contact page on this website. Woodturning Fundamentals covers introduction to the lathe, turning tools , sharpening, basic spindle turning and basic bowl turning. This class is for beginners with little or no turning experience. Introductory Bowl Turning covers introduction to the lathe, bowl turning tools, bowl gouge sharpening and a focus on bowl turning. It includes cutting to eliminate tear-out, shear scraping, grain/cutting direction, mounting techniques with the scroll chuck and power sanding. Although not necessary, basic turning skills will be helpful for this class. Intermediate Woodturning covers introduction to the lathe, turning tools and general sharpening as well as spindle, vase, bowl and platter turning as time allows. It includes cutting to eliminate tear-out, shear scraping, grain/cutting direction, mounting techniques and power sanding. Basic turning skills will be helpful for this class. Intermediate Bowl and Platter Turning covers introduction to the lathe, bowl turning tools and bowl gouge sharpening as well as bowl turning and platter turning. It includes cutting to eliminate tear-out, shear scraping, grain/cutting direction, mounting techniques, power sanding and some simple embellishment techniques for platters. Basic turning skills will be helpful for this class. "There are many teachers who are passionate. There are teachers who are passionate, skilled and competent. There are teachers who are passionate, skilled, competent and communicate well. There are teachers who are passionate, skilled, competent, communicate and push the boundaries of their creative expressions. There are very rare breed of teachers who are passionate, skilled, competent, communicate, push the boundaries of their creative expressions and draw the same from their students. These are the ultimate. Frank is one such rare breed of teachers in wood turning. Frank's instruction is thorough, the teaching environment is very professional, less overwhelming and shop well equipped. I encourage everyone who is looking to wood turning as a hobby or as a profession or expression of their creative desire, look no further. Frank and his wonderful wife Helen are committed to students they come across, as no other." 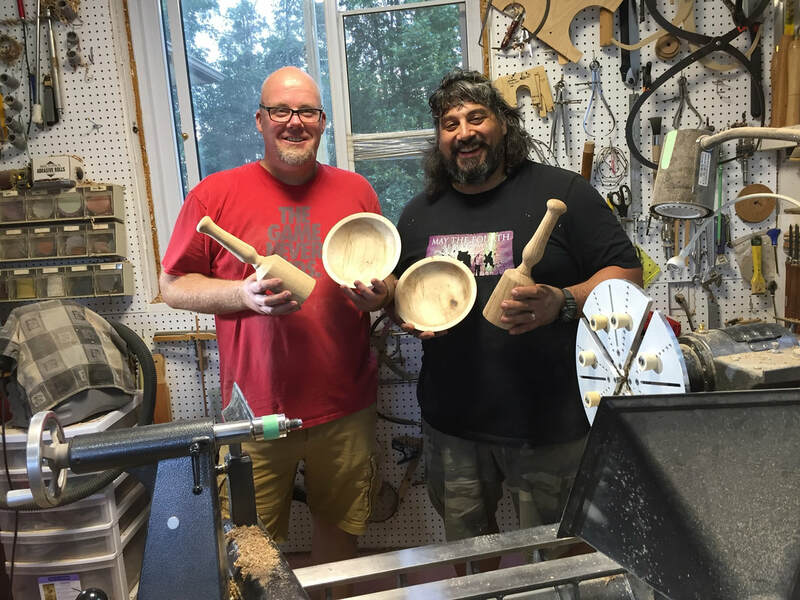 Artistic, passionate, adaptable, patient and knowledgeable: these words epitomize Frank's approach to teaching and learning relative to the art of wood turning. Not only does he provide thorough and detailed step-by-step notes relative to the projects you are working on, but his commitment towards ensuring you are comfortable with the tools, materials, and equipment is without compromise. Frank has a unique and intuitive ability to gauge the students skill level and to coach the student to a point of independence with the work. Prior to my first class with Frank I hadn’t turned since shop class in high school, nearly 20 years ago. I do have a disclaimer though that anyone considering one of Franks classes should take seriously: once you start, you won’t be able to stop. Franks approach to teaching has reinvigorated my passion for turning. Anyone from the novice turner, such as myself, to the advanced turner, will benefit from Franks classes and approach. His keen interest in pushing the boundaries where creativity and inspiration meet the raw nature of the wood and mechanical nature of the lathe are what keep me coming back for more. I recommend one of Franks classes, or more than one, without reservation and with the greatest of enthusiasm. I wanted to thank you for the great two days spent in your turning class. Based on your work you are obviously a highly accomplished turner but also a great teacher. I learned a lot and can't wait to apply my new found knowledge at my lathe. I would recommend your classes to both novice turners as well as more advanced turners. Thanks again. I really spent a wonderful day. 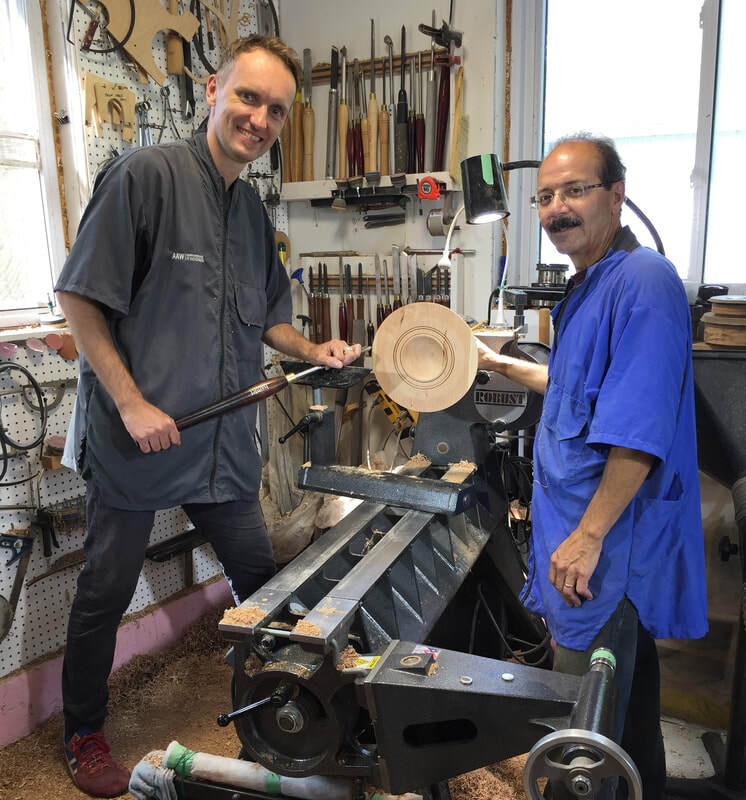 You are a great teacher and your hands-on instructions, useful tips and general knowledge of woodturning are such a wonderful resource for anybody who wants to learn more about woodturning. I feel that just during that one day class with you my woodturning has evolved more than in several months of learning on my own. Spending the day with you was an amazing experience. The course demonstrates your deep understanding of the craft, both the technical aspects, as well as the artistic perspectives. The constant blending of refining my technique with commentary on why certain approaches are preferred, or the subtleties of some of the choices we make in design and how they are perceived left me feeling that every moment was a learning opportunity on multiple levels. I can only hope that as I look at my completed projects from the day, I can recall all that you taught me. Frank is fantastic. It was my first time woodturning, and I did not know what to expect. It was amazing! Frank gave me a good understanding of the theory and then gently guided me on my first attempts to turn wood. It is a very challenging activity! But even if it is your first time, he lets you do it yourself, and corrects your work just enough to guarantee a good result, showing you the perfect technique. I had so much fun that time flew by! in the end, I could not believe how beautiful were the two pieces we did together. He is a very talented artist and a great teacher. The YouTube video shown below is from my Decorative Platters demonstration at Advantage Lumber for the Sarasota Woodturning Club in Florida. I completed the demonstration in February, 2018.